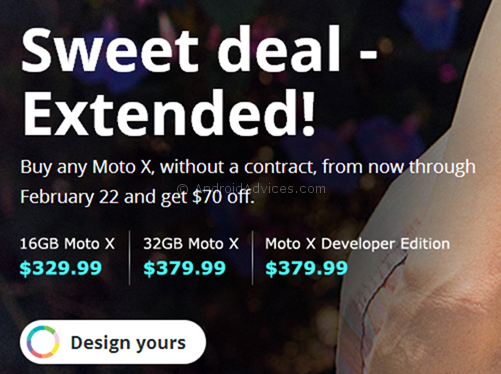 The Sweet Deal on the Moto X is now extended, as Motorola is offering the new pricing of $329 for the 16GB version through February 22nd, if people had missed it out till February 14th, the Valentine’s day. If you still are considering a Motorola phone, this is the one to get right now. That single hour of $100 discount had ended, and now Motorola is still luring the customers with a good $70 discount to the already discounted Moto X smartphone, which would take the final pricing of it to $329. Check out the Moto Maker website for the deal which is live right now, and would be running till the Valentines day, so you have a couple weeks to decide anytime and buy one. There have been several developments from Motorola when you talk about the pricing of the Moto X smartphone. After launching it at a quite high price initially, the company reduced the price to $549.99, and then came the customization options which further put a bigger hole in the pocket, so Motorola decided to reduce the price of Moto X to $399.99 permanently, which was said to be a good deal. But was that still looking good? not for many because the Bamboo customization which everyone were impressed with, had a price tag of $100, making the final price of the device at $499. On Monday January 27th, we’re kicking off our Valentine’s Day sale with an extra sweet deal: $100 off any #MotoX without a contract from 3pm-4pm ET. This deal is only available for one hour, while supplies last. If you miss out, don’t worry. 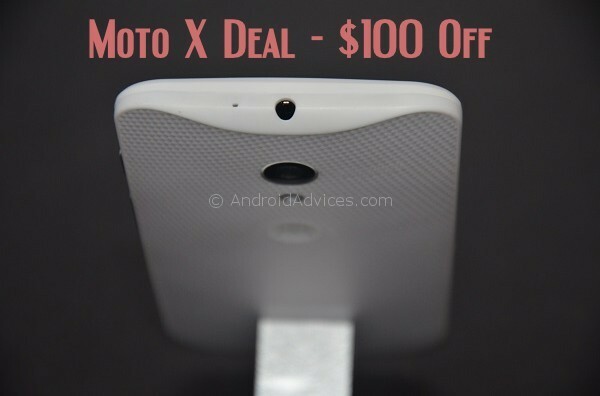 You can get $70 off any #MotoX without a contract through Valentine’s Day. Yes, you got it right. Moto X for $299 is a price someone would not want to miss, if they are seriously looking for a very decent smartphone with the latest software. The $299 pricing is for the 16GB model, and keep in mind that the deal would run for just one hour as said in the update, but if you miss out (either if the deal time is finished, or if the supplies are finished), you aren’t going to be in a big loss, because Motorola is being generous till Valentines day, as you would still receive a discount of $70 through February 14th 2014. As always, this deal too would be running on the Motorola’s Moto Maker website, so if you wanted to spend some extra dollars for the customization of the device, you could do that at the same time. We’ll let you know a few hours before the deal goes live, so that you take the advantage of it. Check out the Moto X review we did, and you will know why we loved the device (except for the pricing then, which is now being reduced quite a lot).